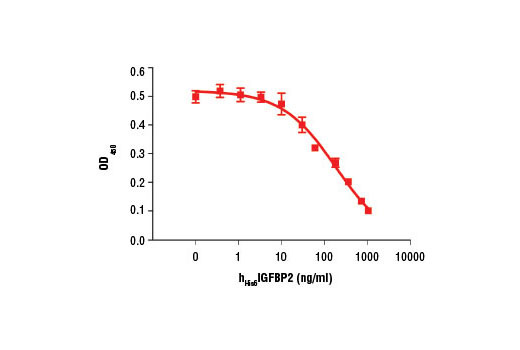 The purity of recombinant hHis6 IGFBP2 was determined by SDS-PAGE of 6 µg reduced (+) and nonreduced (-) recombinant hHis6 IGFBP2 and staining overnight with Coomassie Blue. The inhibition of IGF-I induced Akt phosphorylation by hHis6IGFBP2. Human dermal fibroblasts were treated with Human Insulin-like Growth Factor I (hIGF-I) # 8917 in the presence or absence of increasing concentrations of hHis6IGFBP2 for 10 minutes, lysed, and Akt1 (Ser473) phosphorylation was quantified using the PathScan® Phospho-Akt1 (Ser473) Sandwich ELISA Kit #7160. Recombinant Human His6IGFBP2 (hHis6IGFBP2) Glu40-Gln328 (Accession #NP_18065) was expressed in human 293 cells at Cell Signaling Technology. >95% as determined by SDS-PAGE of 6 μg reduced (+) and nonreduced (-) recombinant hHisIGFBP2. All lots are greater than 95% pure. Recombinant amino-terminally His6-tagged hIGFBP2 has a calculated MW of 32,998 Da. DTT-reduced and nonreduced protein migrates as a 37 kDa polypeptide. The expected amino terminus of recombinant hHis6IGFBP2 was verified by amino acid sequencing. The bioactivity of hHis6IGFBP2 was determined by inhibition of IGF-I induced AKT phosphorylation in human dermal fibroblasts. The ED50 of each lot is between 0.1 and 0.5 µg/ml. Less than 0.01 ng endotoxin/1 μg hHis6IGFBP2. With carrier: Lyophilized from a 0.22 μm filtered solution of hHis6IGFBP2 in 20 mM Tris, pH 7.2 containing 20 μg BSA per 1 μg hHis6IGFBP2. Carrier free: Lyophilized from a 0.22 μm filtered solution of hHis6IGFBP2 in 20 mM Tris, pH 7.2. 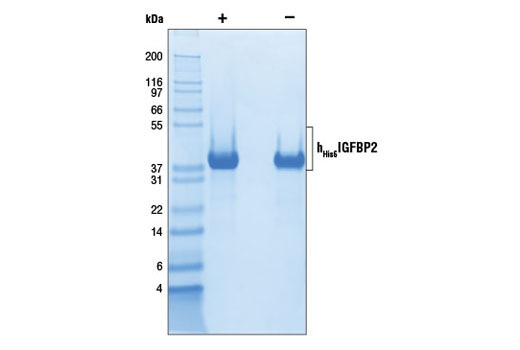 IGFBP2 is a multifunctional protein that plays a key role in the regulation of IGFI/II activity, cell proliferation, and cell adhesion (1,2). One of six high-affinity IGF binding proteins, IGFBP2 is the second most abundant IGFBP species in circulation (1). IGFBP2 can antagonize IGF signaling, or directly stimulate cell proliferation depending on context and cell type (1,2). Many of these effects are IGF independent (2). Elevated serum levels of IGFBP2 have been reported in a variety of cancers (1,2). IGFBP2 has been implicated in angiogenesis in a murine melanoma model (3). Fukushima, T. and Kataoka, H. (2007) Anticancer Res 27, 3685-92. Hoeflich, A. et al. (2001) Cancer Res 61, 8601-10. Das, S.K. et al. (2013) Cancer Res 73, 844-54.